Do you ever find yourself teeter-tottering between wanting to change and wanting to be content with who you are? 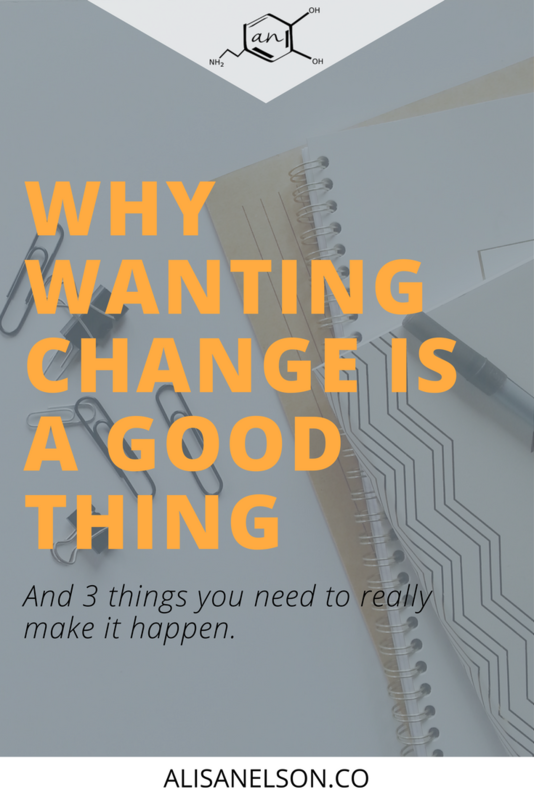 It’s a common dilemma – and one that requires a mindset shift in how you think about – and implement – change. Without realizing it, we can make change impossible. Whether through fear of setting our expectations too high or holding too tightly to the expectations we’ve set. But change isn’t a magic trick. It won’t suddenly appear because you wish for it while living life the way you always have. Today we’re going to dive in to three things that will help push you over the edge from kinda-sorta wanting life to be different >>> taking the action required to grow and thrive in your individual context. There are a lot of barriers to change. Too many to even account for all of them. And on top of that, I keep seeing women around me add an additional obstacle where they fear the desire for change. As if it is a sign of ingratitude or the absence of grace. Here’s the thing: we are always changing. Humans take over two decades to fully develop and neuroscientists are still uncovering the ways the brain can change and grow all throughout our lives. We also demonstrate through history that discontentment with the status quo is a beautiful part of our culture. It brought us through the dark ages and into this period of time when we can actually fathom the possibility of future generations living on Mars. Change – and the pursuit of change – open our eyes to awe and wonder at the world around us as we continue to uncover its mystery. A desire for change is not a judgment of the present. At least it doesn’t have to be. A mindful + connected approach to change allows us to stay attuned to our present circumstances and make decisions with greater intentionality. When you are aware of your present self, your relationships, your dreams for the future, you can approach change with clarity and courage. Nikki Elledge Brown often says, “It doesn’t need to be perfect, it just needs to be shared.” And she is right. It’s why I chose to share the my first video a couple of weeks ago. It’s why I chose to tell people I would be posting the video before it was even ready. But there is a key point embedded in this phrase that we are going to pull out — the sharing doesn’t mean you never go back and consider how to improve. There’s an area of validity for sharing the stuff that turned out poorly…but it’s not black and white. Ultimately, I shared the video I made a couple of weeks ago but chose not to share the one I made for this post. I enjoy making video and really want to keep doing it. But I know improvements need to be made — like in my systems and my technology — to accommodate my real life. The product for this video did not meet my standard – and I didn’t have time to reshoot. Which way on the spectrum am I leaning then? Toward grace or toward perfection? I wouldn’t even use that scale. I would say I’m being intentional. I often get into conversations with women who have been knocked down and have chosen to just roll in the mud. Taking knocks is a fact of life – and we can even end up having fun with it – but choosing to spend all our time on the ground because we’re “embracing” the mud is…not going to get you to the change you want. And will probably make you want to sling mud at others who have managed (for the moment) to stay clean. At some point you have to look at the mess on your clothes and decide to wash up so you can get back to work. This is much easier to do when we expect things to be imperfect and also expect ourselves to get back up and attack the problem. If you simply label something as “giving grace” or “perfectionism” then you add a big emotional cloud to the situation. Now you don’t know how to take action because you’re afraid of being a perfectionist but you also have a deep longing for change. By scrapping the “grace not perfection” frame of thinking we enable ourselves instead to set a standard of performance that fits our current capability. This standard is specific to the person – because it takes into consideration their real life and their personal aspirations. If you want to make drastic changes and you’re willing to do the work, it will look like perfectionism to some. When I was a personal trainer I considered doing bodybuilding competitions – but as I familiarized myself with what it would take to get to the level I wanted, I realized that I wasn’t willing to pay that price. On the opposite side, if chose to pursue bodybuilding competitions, then I would have to let go of some things in order to balance it out. By decreasing the standard of performance in another area, I release myself from the emotional / mental burden of overcommitment and excessive expectation. Assess the cost – like nitty gritty what will it take and is that within reason for you…what will you have to let go of? These steps allow you intentionally set a goal for change. Passive goals that heap guilt without the clarity of action steps for success won’t get you anywhere – except maybe further away from where you want to be. The more clarity you have on what your life can handle now – what actions, what sacrifices, etc. – the better you will get at setting goals. You can set a unicorn goal for the year — but it needs to be accompanied by smaller, appropriate action steps and clear indicators of success. Which leads to the next big idea. Assessment is often a dirty word. Especially when things like body image or performance are involved. But assessment does not mean judgment of you as a person. It’s actually not emotional at all. It’s a gathering of relevant data in order to see how you’re doing. I’ve seen assessment free people (including myself) from self-judgment. The way to know you’re moving toward your goal is to measure something. Take your end goal, work backwards, and you can identify the important checkpoints along the way. It is best if these milestones are behavior-based. Which is why I think the best “goals” are actually the development of skills. For example, maybe you want to eat healthier. You might think setting a goal for your weight or number of days eating at home is what you need but I would say what you actually need is the skill of identifying nutrient-dense foods and preparing them in a way you enjoy them. If you feel confident in yourself and enjoy the process, you’re going to change your habits. And it will happen in a more subtle way that makes it easier to sustain. Do you see what this does? It takes the focus off of the stuff you can’t control and on to the skills themselves. Do you know what gaining skills like this can do? Help you enjoy the process of change. Personally, I recently hit a new level of pot roast. I improved the timing and the seasoning and seriously, it’s the meal I wish would never end. It can feel tortuous to try and try to lose weight or reach a promotion. But when you avert your gaze to the stuff that will actually get you to the goal and give your attention to developing yourself, you gain a presence of mind that will yield so many more rewards than a smaller size (and if you apply good nutrition principles, you’ll probably get that too – assuming that is the healthy change). Break those into smaller actions steps if needed + schedule them. I’ve said it a lot throughout my blog already – you need to be aware of where you are actually headed. Not just in words but how will your life actually look and feel when you’ve reached your goal. It’s unbelievably easy to get sucked into someone else’s goal when you have a yearning for change but haven’t taken the time to define a tangible outcome. One way you can cultivate this awareness of where you are going is through visualization. Youtube has a ton of guided visualizations that you can follow to gain a mental image of the person you want to become (just search “future self visualization”). Take the example of my video. When I consider who I want to be – and what I want to be doing – in the next year or few years, I know that I need to move beyond curated sentences and into more live scenarios. So I’m choosing to start practicing now. How else will I become the woman I visualize but through doing the work here in the present when the opportunity presents itself? The daily fires that we must put out do a really good job of keeping us distracted and stagnate. If you truly want to move forward in your life you must make the effort to pick up your head and make sure you’re still headed in the right direction. This includes making time for assessment – regularly checking in on your data in order to ensure you’re seeing the progress you want. Build this cue into your morning and evening routines. Where you consider the destination you are pursuing before you jump into the day and before you wrap it up at night. This practice also helps to tie your present struggles with a future reward. Present me is happy I put in the work the past 5 years in my own wellness journey. And I could say the same about my marriage, my relationship to my kids, my clarity in my professional goals, etc. All still a work in progress but all started because at some point I chose to do the work instead of just dream about waking up one day to a different life. When we’re experiencing stress due to a problem our biochemistry can work to help us dig deep for focus and courage when we tie that obstacle to a deep desire. You have it in you, you just need to practice calling it out. Identify 1 or 2 defining characteristics and break those down into skills, behaviors, and action steps like we did above. Set a reminder on your phone to tune back in to that vision and your current steps. A note here: Don’t be afraid to develop skills that don’t feel snazzy or monumental. Working on your inner life and training yourself to focus better or be more present in your relationships doesn’t feel like a big return in terms of $$$ but they mean so much for your wellbeing AND create a foundation from which you can continue to grow personally. Most likely you are tuning into the stuff that’s really going to help you stay satisfied + connected in your real life. That’s something worth fighting for. Leave a comment below and tell me 1 insight you’ve had from this post.